Franchising — Greenberry's Coffee Co.
own a greenberry's ANYWHERE IN THE WORLD! For all- domestic and international franchises, every Greenberry's Coffee Shop has an individual, local flavor, yet is supported by a franchise network with proven systems and procedures. Through this network, we are able to offer the highest quality coffees and teas from all over the world, delicious pastries baked on-site daily and an extensive food program developed by our in-house Executive Chef. Whether it is our warm, inviting atmosphere or the community based partnerships we develop, our goal is to create a "home away from home" for our customers to enjoy. From assisting you in finding the perfect location, guiding you through construction & design, training you and your staff in all areas of owning a Greenberry's Coffee Shop, to ongoing support throughout your business lifecycle, we are here for you every step of the way to ensure that you are always on the right path for success! Once you become the owner of a Greenberry’s Coffee franchise, our team will start helping guide you through the decision making process. Assistance in design and construction is provided as well as product sourcing and vendor negotiations. Ownership Training is held at our home office in Charlottesville, Virginia and goes through a step-by-step guide to opening and running your store. Our role in the opening of your store is to assist in employee training and provide on-site assistance as you prepare for opening day. Once your store opens, we will be at your store the first week you are open to help and support you during this important time. After opening your Greenberry’s store, you will receive on-going consulting in key areas such as marketing, cash-flow analysis, customer relations and day-to-day operations. As a Greenberry’s store-owner, our support staff will be available to you to answer questions at any time. Sites: locations, types, size, etc. Menu: scale to site, menu development and offer adjusted with respect to culture, religion, supply & demand. Ongoing marketing and branding support with Greenberry's Coffee Co.'s corporate team through online & social media, advertising, collateral for events and exhibitions, branded merchandise, promotional material & new ideas. Start-up costs vary depending on a number of factors. These include type of store, location, offerings and new construction/leasehold improvements. Greenberry's offers traditional and non-traditional store models to fit various markets, neighborhoods and budgets. These range from store-fronts to less expensive concepts in hospitals, universities and corporate headquarters. Royalties are 6% of net sales. We also collect an advertising royalty of 1% of net sales. 2. What are the financial requirements to opening a franchise? For traditional street stores, we require $140,000 in liquid assets and a $350,000 minimum net worth. While financial standings are very important, it is equally important to us that we match the right franchisee with our franchise system. The ideal franchisee candidate is a positive, detail-oriented person with a business experience, financial mindfulness, entrepreneurial spirit and a 'roll up their sleeves' leadership style. For non-traditional stores, the cost of opening is significantly lower because they are often a scaled down version of a traditional store. Our requirements for a non-traditional store are reduced accordingly. 3. What training do you provide? The initial franchise fee includes an intensive training at our home office in Charlottesville, Virginia. During this training, franchisees will learn every aspect to owning and operating a Greenberry's Coffee store. We believe that in order to train and manage an outstanding staff, the owners must be familiar with every aspect of the operations of their store. 4. Do I receive assistance in opening my franchise business? Yes. In addition to your initial training period, we will work with you prior to opening and conduct routine meetings to follow your progress. Prior to opening, we will be on-site to conduct product-preparation and product- knowledge training with your employees. Greenberry's representatives will be on-site during your first week of operation and during all opening events to provide guidance and assistance. And before, during and after opening, we will always be available to take calls and answer questions as often as needed. 5. What form of continuing operational guidance will I receive? Our staff will stay in regular contact with you to provide updated information, introduce new products or promotions and to offer assistance with operational or technical problems. 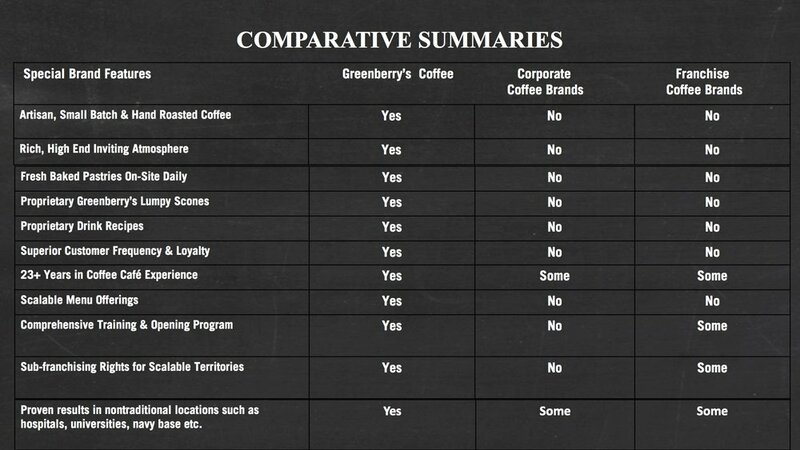 You will also receive the Greenberry's Coffee OperationsManual that will cover many important aspects of your business.